Pakistan says it showed “restraint” while downing two Indian aircraft on Wednesday, including a MiG-21 plane, and insists it does not desire war, but is ready to “retaliate” if India continues to violate its territory. — PTV News (@PTVNewsOfficial) 27 февраля 2019 г. "We have sent a message to India that despite having the capability to engage, we have shown restraint. 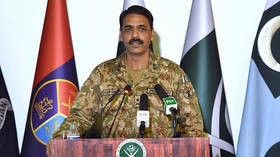 Our aim is to defend our motherland yet ensure no unnecessary provocation to escalate takes place,” spokesman of the Pakistani Army Major General Asif Ghafoor said during a press statement in the capital, Islamabad. Ghafoor said that Pakistan was merely looking to defend itself, following the second incursion from the south in two days. “If aggression is imposed upon on us we will retaliate out of self-defense. Pakistan is not pushing the environment towards war,” the official said.